Whether you come to Idlewild & SoakZone amusement park for the adventures, rides, events, shows or splashes, you'll find everything you need to have a fantastic day! Please review our Rider's Safety Guide in advance of your visit, or stop at Guest Services for more information while visiting. Eight gondolas shaped like hot-air balloons spin in a large circle while rising into the air. Riders have a sensation of soaring in a balloon. Must be 46" tall or accompanied by an Adult. Under 48” must be accompanied by a responsible adult. DANIEL TIGER’S NEIGHBORHOOD © 2012 The Fred Rogers Company. All rights reserved. From the top of this ageless wheel, riders enjoy the beautiful scenery of the magnificent Laurel Highlands. Must be 36" tall. Guests under 48" must be accompanied by an Adult. A timeless favorite! You can be the pilot and control your very own flight aboard one of ten suspended cars flying at speeds of up to 37 miles per hour. Must be 42" tall. Guests under 48" must be accompanied by an Adult. Twist around like a tornado on one of eight, four-seater cars. Make it spin as fast, or as slowly, as you want by using the common wheel in the center of the car. Must be 38" tall. Guests under 48" must be accompanied by an Adult. Floating on swift moving water, the log boats meander amid the mighty trees and rustic surroundings then travel the 125-foot ascent to the top of a 30-foot tower. From there, they come barreling down a chute, splashing all the way! Must Be 36" tall. Guests between 36" and 46" must be accompanied by an Adult. The LLRR takes passengers on a peaceful ride from the Hootin' Holler' Station to Raccoon Lagoon and back. The tracks follow the beautiful Loyalhanna Creek before winding through the cool and shady woods. Must be 48” or accompanied by a responsible adult. This classic Merry-Go-Round is the centerpiece of the Olde Idlewild theme area. One of the last carousels built by the Philadelphia Toboggan Company in the 1920s, it has been in its present home at Idlewild since 1931. Guests under 46" must be accompanied by a responsible adult. Ten umbrella-covered seats resembling parachutes spin around in a counter-clockwise direction. As it spins, the entire ride lifts to a 45 degree angle giving the riders the feeling of parachuting toward the ground only to rise back up again and repeat the cycle. Must be 36" tall. Guests under 46" must be accompanied by an Adult. The Rollo Coaster, originally built by the Philadelphia Toboggan Company in 1938, returns in 2018. The coaster train carries riders up and down along a wooded hillside, then turns around in a swooping curve and returns to the station. Must be 42” tall to ride. Guests under 48” must be accompanied by an adult. 265lb. weight limit per row. Riders face toward the center of this large circular ride. As the ride begins to spin, centrifugal force causes the riders to "stick" to the walls of the ride as it lifts up to a 45 degree angle. Must be 46” tall to ride. It's called the "Scrambler" because when moving, it resembles a common household mixer, or scrambler. Four cars at the end of each arm spin in a circular fashion, while the entire ride also spins in an opposite circular motion. First introduced in 1931, the cars have changed, but the building remains the same. For seven decades, riders have been thrilled by the chance to drive their bumper cars around the rectangular floor in any direction bumping into friends, family, and strangers. Must be 48" tall or taller to ride. Riders enjoy being dipped and spun in every direction. Must be 36” tall to ride. Guests between 36” – 48” must be accompanied by a responsible adult. 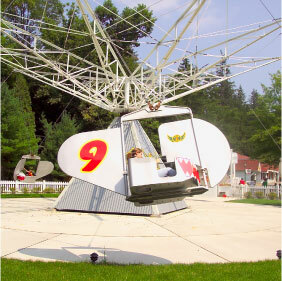 Get ready for some head spinning fun on this classic amusement ride that has remained popular for generations. Hidden among the mighty trees, Idlewild's Wild Mouse is a modern version of the classic roller coaster. Featuring mouse-shaped cars carrying four riders each, the cars travel to the top of the lift then follow the steel track filled with sudden twists, dips and hills. Must be 48" tall or taller. Maximum weight per car of 700 lbs. A large version of the popular handcars that all children love - and the parents get to ride, too! The rider sits on the car and uses the handcrank to power themselves along the railed track. Must be 46" tall to drive. Children under 46" may ride in the small passenger seat. A miniature version of the popular bumper car - just for little kids. Children have the chance to power their own cars around a rectangular floor in any direction they want. Must be 36" tall, yet under 56" tall, to ride. Each child gets to ride on their very own dinosaur. The entire ride slowly spins in a clockwise manner and children can make their dinosaur go up and down. Children must be at least 36” tall, and under 56” tall, to ride. The Doodlebug is a small green trolley for children that runs on two rails in a circular fashion. Must be under 56" tall to ride. Children sit down on the handcar and move themselves along the rails by turning the handcrank in front of them. Every little kid's favorite! Must be under 50" tall. Children can "rev" up the good times on their own motorcycle that's just their size. Every child can be the captain of his or her own boat as they steer one of six boats around Raccoon Lagoon. Must be under 56" tall. A smaller version of the popular Ferris Wheel. Children ride in one of four enclosed cars as they go up and around. Eight classic airplanes go up and down as they are controlled by the young "ace" pilots. A beautiful miniature car ride through the trees. Must be at least 32" but under 56” tall; Children between 32” -42” must be accompanied by someone between 42” – 56” tall. Miniature antique cars moving together in a circular manner. Parents can enjoy taking a "spin" with their children in one of 6 life size tea cups. Enjoy the party! Guests under 36" tall must be accompanied by an adult. One adult per car. Children and their parents can ride together in one of three linked turtles. The turtles "crawl" along a circular track with plenty of hills and dips. What a sensation! Parents can ride with children. Children under 36” tall must ride with a responsible adult. One guest over 56” tall is permitted per turtle car. Story Book Forest is a park built not on motion, but rather emotion - a very special place where little ones can meet their favorite characters from nursery rhymes and children's tales and where parents and grandparents can revisit their youth and reminisce about simpler times. Jump into the Jungle's huge Ball Pit! Two teenagers maximum. Hand Held Infants must be accompanied by an Adult. Must be 32" tall to ride. Guests 32"-42" must be accompanied by an Adult. Tons of fun as the balls float on air! Play your very own tune on this gigantic musical instrument! Can you climb all the way to the top? Must be 36” tall. Two teenagers maximum at one time. Atop the Safari Hut you can observe all of the Jungle's wildlife and then slide down and join in on the fun. Once on the Jungle floor, don't forget to crawl through the GIANT Eucalyptus tree trunk that serves as the base for Safari Hut. Adults not permitted to use the slides. Steady, steady...as you cross this moving bridge! Hand Held Infants must be accompanied by an Adult. Like the net climb, but enclosed on four sides! No minimum Height Requirement. Guest must be able to walk independently to the ride. Featuring six waterslides and dozens of interactive spray features! Must be 36" tall for slides less than 8' in height an Must be 40" tall for slides over 8' in height. Must be under 300 lbs. No Hand Held infants. An endless river of relaxation. Grab a tube and go with the flow. The all-new Float Away Bay is an instant family favorite. It's the classic way to chill in the sun. Just relax and let your cares float away! Weak or Non-Swimmers must wear a Coast Guard approved life jacket. Life jackets are available at the waterpark. Recommended that weak or non-swimmers stay within an arm's length of parent/guardian. Our children's pool and water fun area. Twist down one of two twisting pipelines in a two-person raft while dropping 50 feet. Thrilling water curtains greet you as you near the end! 36" minimum height requirement. Guests between 36" and 48" must be accompanied by a responsible adult. No hand held infants. Maximum weight limit of 250 lbs for a single tube, and 400 lbs. for a double tube. Ride the twisting and turning slides with a big splash at the end! Must be 48” to ride. Maximum weight of 250 lbs. Hundreds of gallons of water dumping all over you and your friends. Get Soaked to the MAX! Guests under 48" are REQUIRED to wear a Coast Guard approved life jacket and be accompanied by an adult. Life jackets are available at the waterpark free of charge. At Idlewild, you'll experience Pennsylvania attractions like never before. With over 35 different rides, attractions, and shows, the entire family is sure to have a summer of fun! Skip through Story Book Forest, where dreams and Story Book friends are real, and get ready for the all new trolley ride, Daniel Tiger's Neighborhood. Combining the best children's adventures and local attractions near Pittsburgh, PA, there truly is nothing like a day spent at Idlewild & SoakZone filled with laughs, memories, great places to eat, and family-friendly rides. Enjoy a good nursery rhyme or children's tale in the Story Book Forest, take a plunge into a wave of water on Paul Bunyan's Loggin' Toboggan, or meet your favorite friend, Daniel the Tiger. Review our Rider's Safety Guide in advance of your visit, or stop at Guest Services for more information while visiting. Splash around and explore SoakZone, Pennsylvania's family fun water park. Twist and turn down the Pipeline Plunge or go head-first on the Hydro Racers. If you’re looking for a place to relax, grab a tube and take a float down the Float Away Bay. While Idlewild & SoakZone is home to the best family-friendly attractions for kids near Pittsburgh, Pennsylvania, our in-park kid's shows can't be missed. Be sure to bring the little ones along! Break out those dancing shows and watch bands battle it out in "Let's Rock". Watch some wacky wild west stunt shows with fun and funky music! Plan your Idlewild & SoakZone trip ahead and buy your tickets and passes online!